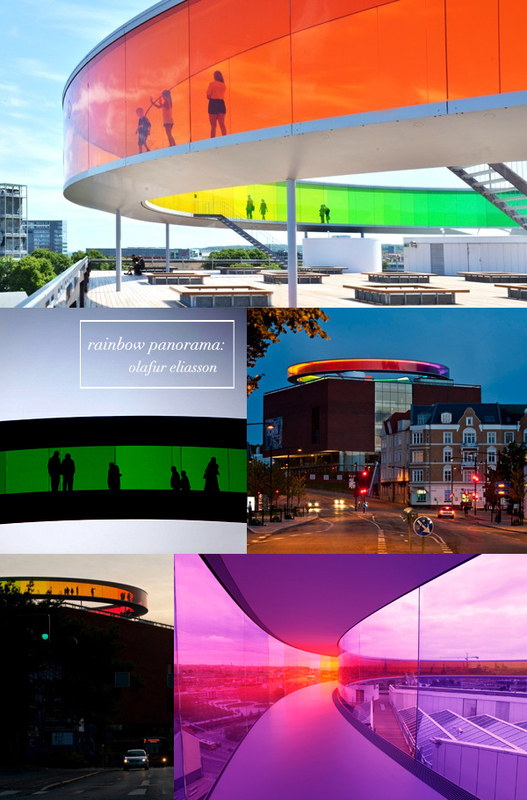 The Rainbow Panorama by Olafur Eliasson on the rooftop of the Aros museum in Aarhus, Denmark looks absolutely mind blowing. I want to be there during a sunrise or sunset to walk around and see how the light and colors come alive (yes, I will probably be adding this to my bucket list to visit after I finish typing this). The collection of work that Olafur Eliasson and his team has done is extraordinary. I spent some time going through the projects and wow, brilliant stuff my friends. Brilliant. That's very impressive. You're right - worth adding on the bucket list. Thanks for sharing it. But yeah if you ever get there go and I'm not boasting it just is brilliant! I'm not sure I can muster up more than "wow." This is beautiful! I'd love to go at sunset/sunrise and see all those colors. Thank you for sharing this! Maybe I can convince them to build one on top of my building. So creative! We can finally all see the world through "rose colored glasses" and so many other shades!! GASP! LOVE it! Those Danes... I tell ya'! One more thing to love about 'em! I LOVE THIS! Wow, thanks for sharing, Rachel, I hadn't seen this one yet. I've been an Olaffur Eliasson fan for a long time (although I obv. don't do the best job of keeping up.) The show at the MoMA a few years back... I loved it. And I really wish I could have seen that show he did at the Tate Modern a long time ago where it looked like a sun was setting inside the big hall... Always brilliant. Amazing and I loooooove it! Wow - so cool. Walking in the middle of a rainbow!! wow. it indeed looks brilliant!